What’s up people. Do you know what’s the most happening thing in Ahmedabad on Friday night on 10th of August at 8pm at Studio Pepperfry? We’re here with an amazing lineup of 4 kickass comics who will make your Friday night the most beautiful night in the history of mankind. Chirayu Mistry : chirayu needs no introduction but still This writer and stand up comedian is a home grown Barodian with a twist. Chirayu weaves a wonderful web of laughs wherever he goes and is known for his ‘Vikrut’ but clean comedy infused with observations on life, Bollywood and people in general. 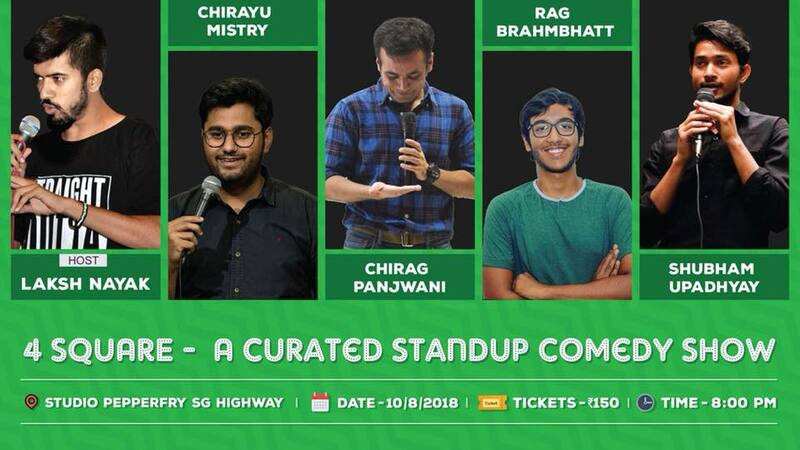 Chirayu is most comfortable performing in Gujarati and Hindi and has quickly risen to being one of the funniest acts of Gujarat since 2018. Rag Brahmbhatt : Rag is a very friendly comic with no enemies anywhere. Even we don’t know what is Rag gonna do because Rag is full of surprises. Rag is magic. Chirag Panjwani – Chirag started doing comedy in delhi. But that was very easy, chirag wanted to do something adventurous and wanted to do comedy in tough conditions so chirag shifted to Ahmedabad. Shubham Upadhyay – shubham has a lot of funny stories to tell about his life and how it was to grow up in a small town from Rajasthan.